This is going to be an extremely difficult CD to review at any length, since decency demands that it shouldn't be just a rehash of the McNamara Family CD review, and nor ought it to re-use the same list of superlatives - but it's very, very hard not to! 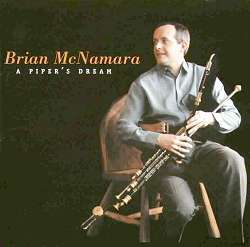 In one way A Piper's Dream is even more of an achievement than Leitrim's Hidden Treasure. To make a wonderful record with a six-piece band is one thing - to present 64 minutes of more-or-less solo playing and retain the listener's interest right to the last note is not a trick many have been able to master ... certainly not at Brian's relatively young age. But he has and he does. I called this 'more-or-less solo' playing because Brian is joined at times by his sister Deirdre on concertina and backed by Michael Rooney on harp and Jens Kommnick on guitar. My preference is for unaccompanied solo performance (as is the case here in 10 of the 17 tracks), but I can find little to quarrel with in the contributions of any of these musicians. Deirdre plays so tightly with her brother that it's often difficult to believe that you're actually hearing two separate instruments, although I'm pleased to see that she does get to lead the set at least once - in the jigs track 8 (sound clip - Stoney Batter), but this may just be that Brian's playing a flat-pitched set, so that the higher-voiced concertina is more obvious. I commented that the Family's music sounded as if someone had magically shipped modern recording equipment back a couple of generations in time. Here, that effect is less marked - not because Brian lacks the older style, but because the sets of pipes he uses are quite definitely 'modern' in sound - and you can clearly hear this because his playing is not masked by the other instruments of the band. This is not in any way a critical observation - though I have to admit to missing the rasp of brother Enda's fiddle now and again! In truth, I have only one tiny criticism of this CD, and that's regarding an aspect of taste in the production. At the end of each track, the sound of the pipes is faded for the last half second or so, to produce a nice clean finish, rather than letting us hear the occasional grunt and squeak as the reeds lose critical pressure. In almost any other circumstances this would be acceptable - but because of the old-style playing and naturalness of the performances, it actually jars. Somehow, it seems like a step-too-far in good taste - like using the euphemistic 'rest-room' instead of the lavatory! All in all, a thoroughly excellent CD - contending for my 'Irish music record of the year' award with Charlie Lennon's Time for a Tune reviewed last month.